Ranger Robert L. Howard was one of America's most decorated combat soldiers. He was born 11 July 1939 in Opelika, Alabama. He joined the Army at age 17 in 1956. He served five tours in Vietnam and is the only soldier in our nation's history to be nominated for the Congressional Medal of Honor three times for three separate actions within a thirteen month period. The first nomination was downgraded to the Distinguished Service Cross. The second nomination was downgraded to the Silver Star. 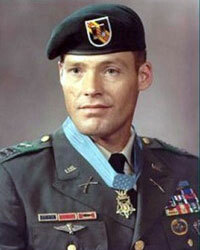 The third nomination was downgraded to a 2nd Distinguished Service Cross but later upgraded to the Medal of Honor. He received a direct appointment from Master Sergeant to 1st Lieutenant in 1969, and was awarded the Medal of Honor by President Richard M. Nixon at the White House in 1971. His other awards for valor include the Distinguished Service Cross - our nation's second highest award, the Silver Star - the third highest award, and numerous lesser decorations for Valor including eight Purple Hearts for wounds in combat. He received all his decorations for valor while serving as a Non-Commissioned Officer. Robert L. Howard retired as a full Colonel in 1992 after 36 years of military service. During Vietnam, he served in the U.S. Army Special Forces (Green Berets) and spent most of his five tours in the super-secret MACV-SOG (Military Assistance Command Vietnam- Studies and Observations Group) also known as Special Operations Group, which ran classified cross-border operations into Laos, Cambodia, and North Vietnam. These men carried out some of the most daring and dangerous missions ever conducted by the U.S. military. The under strength sixty-man recon company at Kontum in which he served was the Vietnam War's most highly decorated unit of its size with five Medals of Honor. It was for his actions while serving on a mission to rescue a fellow soldier, that he was submitted for the Medal of Honor the third time for his extraordinary heroism. Never one to quit training, Robert Howard volunteered for Ranger School and graduated with Ranger Class 7-73 in May 1973 and later served as a Ranger Company Commander at Fort Benning and twice Commanded Ranger Companies in the 2nd Ranger Bn at Fort Lewis, Washington. Later, He was a Ranger Instructor here at the Mountain Ranger Camp from 1977-78 and later still a Special Forces Instructor at Fort Bragg, N.C.
As far as I know he is the only recipient of The Medal of Honor to subsequently go through Ranger School, which he did in 1973. The President of the United States in the name of The Congress takes pride in presenting the MEDAL OF HONOR to FIRST LIEUTENANT ROBERT L. HOWARD, UNITED STATES ARMY For conspicuous gallantry and intrepidity in action at the risk of his life above and beyond the call of duty. 1st Lt. Howard (then Sergeant First Class), distinguished himself while serving as platoon sergeant of an American-Vietnamese platoon which was on a mission to rescue a missing American soldier in enemy controlled territory in the Republic of Vietnam. The platoon had left its helicopter landing zone and was moving out on its mission when it was attacked by an estimated 2-company force. During the initial engagement, 1st Lt. Howard was wounded and his weapon destroyed by a grenade explosion. 1st Lt. Howard saw his platoon leader had been wounded seriously and was exposed to fire. Although unable to walk, and weaponless, 1st Lt. Howard unhesitatingly crawled through a hail of fire to retrieve his wounded leader. As 1st Lt. Howard was administering first aid and removing the officer's equipment, an enemy bullet struck 1 of the ammunition pouches on the lieutenant's belt, detonating several magazines of ammunition. 1st Lt. Howard momentarily sought cover and then realizing that he must rejoin the platoon, which had been disorganized by the enemy attack, he again began dragging the seriously wounded officer toward the platoon area. Through his outstanding example of indomitable courage and bravery, 1st Lt. Howard was able to rally the platoon into an organized defense force. With complete disregard for his safety, 1st Lt. Howard crawled from position to position, administering first aid to the wounded, giving encouragement to the defenders and directing their fire on the encircling enemy. For 3 1/2 hours 1st Lt. Howard's small force and supporting aircraft successfully repulsed enemy attacks and finally were in sufficient control to permit the landing of rescue helicopters. 1st Lt. Howard personally supervised the loading of his men and did not leave the bullet-swept landing zone until all were aboard safely. 1st Lt. Howard's gallantry in action, his complete devotion to the welfare of his men at the risk of his life were in keeping with the highest traditions of the military service and reflect great credit on himself, his unit, and the U.S. Army. Ranger Robert L. Howard died in Waco, Texas on 23 December 2009 and was buried at Arlington National Cemetery. He was 70 years old.